Silvia Rizzo and Sal half-pass. 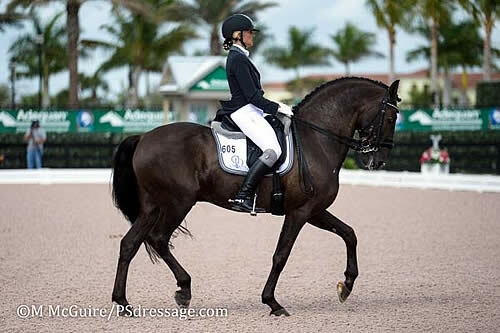 Wellington, FL – February 22, 2014 – Silvia Rizzo of Italy and her new horse Sal, a 15-year-old Lusitano stallion (Mississipe – Maia, Golegã), are beginning to forge a solid connection in the dressage arena after just 10 weeks together. 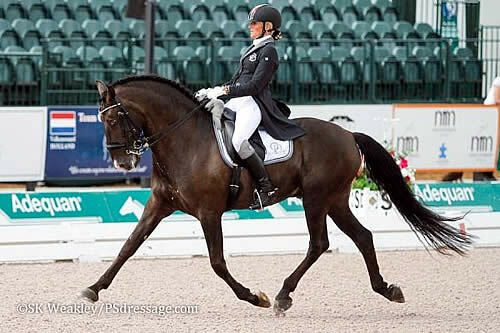 Although they are just learning to trust each other, the two have consistently boosted their scores during the Adequan Global Dressage Festival. The pair earned a 63.080 in Friday’s Grand Prix CDI3*. Rizzo’s trainer and partner, Michele Betti, the former chef d’equipe of the Italian Eventing Team, is happy with the confidence with which Rizzo and Sal have been riding. Rizzo has been working diligently to put Betti’s advice into practice. Rizzo thought the piaffe had good balance and rhythm and the judges thought so too, as they received a 7.5 for the piaffe. Rizzo and Betti hope to continue their upward direction with Sal as the competition continues this season in Florida. “We are coming together and I am so happy,” Rizzo said.